Wooden Tile Fitted Bed dimension in cm : H 92.5 & 42.5 W 188 L 205. Mattress area 182.5 by 198. Weighs 88 Kg. Pick up from Display Center. 36 different designers ceramic tiles 10 cm by 10 cm are artistically crafted in the head part as well as feet part of bed. The head part has height of 92.5 cm and 3.2 cm thick smooth wood. Feet part has height of 42.5 cm and 3.5 cm thick wood. The overall size of bed is 205 cm long and 188 cm wide. Both sides are 10cm by 2.5 cm well supported by solid wood support beams. Solid Ply 1 cm thick 197 cm by 91 provides provide support. All the four corners are well secured by threaded bolts and nuts. Inner area available to get a mattress of size 198 cm by 182.5 cm. It weighs 88 Kg and easy to assemble. 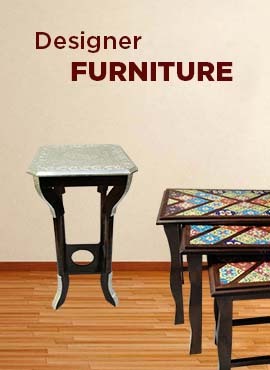 The Tile Fitted Wooden Bed is made with quality wood material.